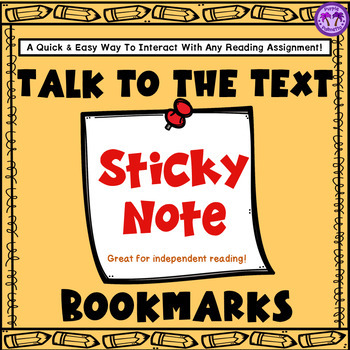 Sticky Note bookmarks for your students! 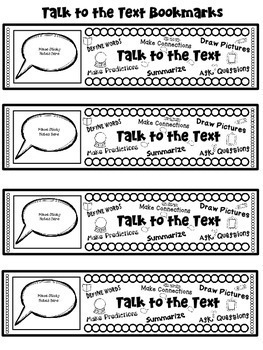 These bookmarks are great for “Talking to the Text” when students can’t actually write on the text. For instance, when reading novels or from anthologies that belong to the school. 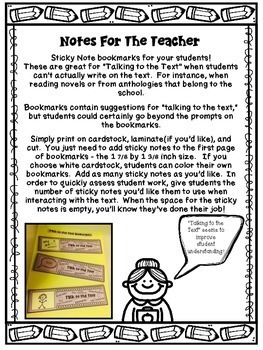 Bookmarks contain suggestions for “talking to the text,” but students could certainly go beyond the prompts on the bookmark. 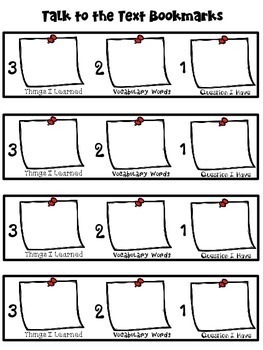 Simply print on cardstock, laminate, and cut. *You just need to add sticky notes to the first page of bookmarks - the 1 7/8 by 1 3/8 inch size. FOUR unique sets of bookmarks included!! If you like this product, please visit my store to see other products by Purple Palmetto!